This is a very versatile rose; it can be used in hanging baskets, containers, or trained up a fence post. It can be covered in bright red, 1” blooms. The foliage is fine-leaved and very healthy. It was introduced as a weeping miniature, but the blooms are the only part of the rose that are small. The canes can get from 12 to 18 feet in length! 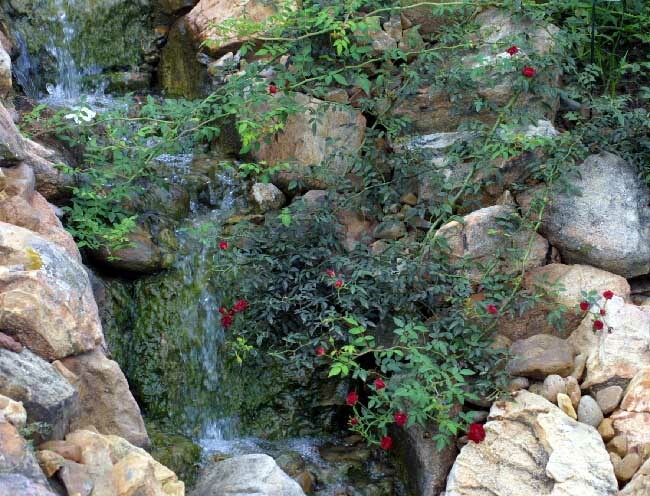 This 'Red Cascade' is cascading down by our waterfall. With very little water and poor soil, this is six months of growth. Bred in California in 1976 by Ralph S. Moore.